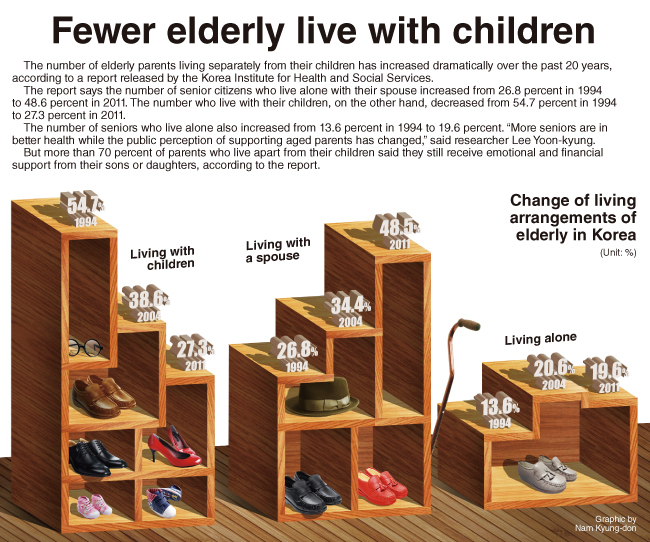 The number of elderly parents living separately from their children has increased dramatically over the past 20 years, according to a report released by the Korea Institute for Health and Social Services. The report says the number of senior citizens who live alone with their spouse increased from 26.8 percent in 1994 to 48.6 percent in 2011. The number who live with their children, on the other hand, decreased from 54.7 percent in 1994 to 27.3 percent in 2011. The number of seniors who live alone also increased from 13.6 percent in 1994 to 19.6 percent. “More seniors are in better health while the public perception of supporting aged parents has changed,” said researcher Lee Yoon-kyung. But more than 70 percent of parents who live apart from their children said they still receive emotional and financial support from their sons or daughters, according to the report.